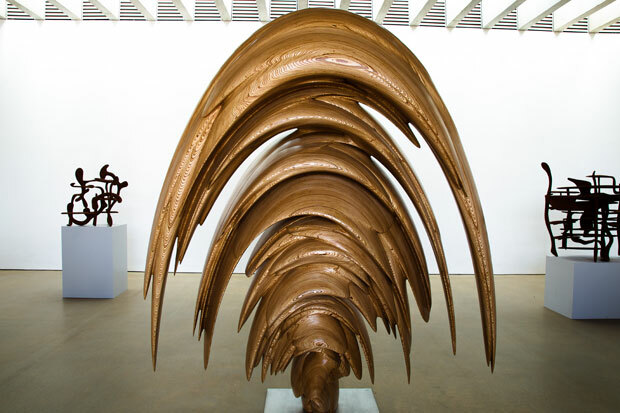 Tony Cragg left the UK for Germany in 1977, the same year Yorkshire Sculpture Park (YSP) was founded on a 500-acre country estate near Wakefield. 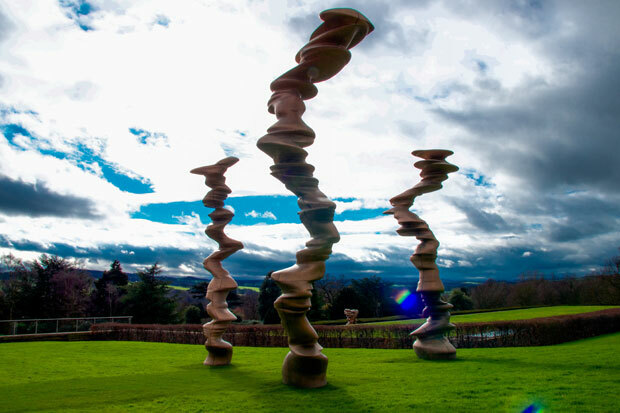 In the 40 years since, Cragg has become a truly international artist, and YSP an internationally renowned arts venue. Now the two have mounted an extensive exhibition of new and recent works, artfully contextualised with key pieces from Cragg’s prolific career. The eponymous ‘Rare Category of Objects’, for Cragg, is sculpture itself. Echoing Walter Benjamin, he is a vocal critic of the ‘mediocrities’ of mass design, which he challenges through his assiduous engagement with his materials. This alertness to physicality and willingness to constantly address it anew makes his wood pieces perhaps his most compelling. 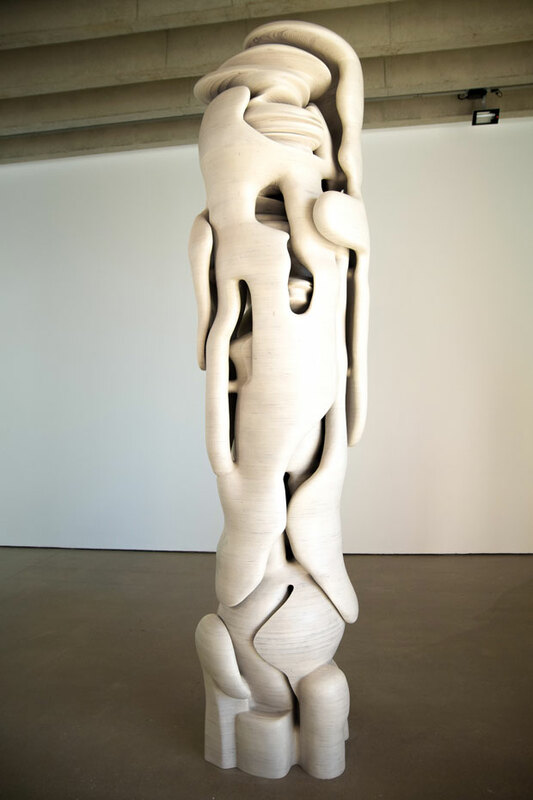 Spring (2016) and Group (2012) – both in YSP’s Underground Gallery – were created by a process of iteratively adding and shaping layers of plywood with little predetermined design. Every passing moment of creation informs the next, as do the material’s intrinsic properties and the forces to which it is subject. Cragg’s meticulous handmade approach, for which he employed the help of 20 assistants in his Wuppertal studio, defies the supposed vapidity of mass production to create unique pieces so complex they are sometimes impossible to cast. Certain creations are surprisingly literal despite appearing abstract. The elaborate interplay of interior and exterior planes in Lost in Thought (2015) openly references the relationship between our inner and outer selves. Similarly, a recent series of Hedge sculptures evokes the intricate matrices of branches that lie beneath the surface of hedgerows, recalling those in YSP’s 18th-century gardens. An occasional tendency towards cubism results in a number of works that explore both visual and tactile perception with equal weight, notably in a series of ‘portraits’ whose abstracted forms derive from the recursive profile of a face. Out in the open air, Points of View (2013) and other pieces treat perspective as a force capable of warping an object out of dull uniformity. The artist deliberately allowed the angle from which the pieces were viewed to influence their form as they developed. Were the material treated differently – as something to be seen and worked on from one perspective and with a preconceived notion of the eventual form – these gnarled bronzes might conceivably rise from the ground with the uniformity endowed by a manufacturer’s specifications; however, Cragg’s alternative approach to his task activates them, favouring creative intelligence to mechanical production. For a time Cragg was resistant to using bronze, opting instead to work with iron in conscious alignment with Richard Serra over Henry Moore. This had as much to do with differences in the sculptural problems he and Moore faced as with the material, whose necessary hollowness conflicted with his interest in interiority. By the time Cragg came to his art, the issues of breaking away from sculptural tradition had already been explored in bronze by his predecessor, opening the way for new challenges. There are nonetheless many exceptional bronze pieces on display, including from the series of cast Early Forms, whose flowing lines and planes evoke the lips of oyster shells and the endlessly regenerating curvature of the sea. As with a small selection of watercolours displayed elsewhere, they also highlight Cragg’s virtuosity as a colourist. Whether exploring colour or form, this exhibition, like the art, draws its strength from its attentiveness to change. It helps us view the sculptor’s work as he views the world: always with a fresh eye. 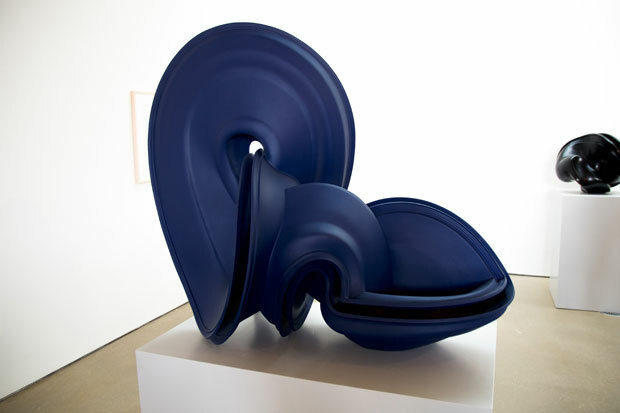 ‘Tony Cragg: A Rare Category of Objects’ is at Yorkshire Sculpture Park until 3 September. Richard Serra’s monumental move in Washington, D.C.